Arby’s, in its latest hunting-related extreme limited-time offer, is selling duck sandwiches at 16 locations in duck-hunting country this Saturday, Oct. 20. Sourced from duck supplier Maple Leaf Farms, the sandwiches will be made from duck breast that is seared, cooked in sous-vide and topped with fried onions and smoked cherry sauce on a toasted bun. The sandwiches will be offered in limited quantities for $6.99 while supplies last which, based on past experience from similar Arby’s LTOs, will be less than a day. An Arby’s spokeswoman said the 16 restaurants are all in the four “waterfowl migration flyways” on the Atlantic, the central United States, the Mississippi River and the Pacific, and each of the restaurants was selected for its proximity to duck-hunting areas. 2731 Dorchester Square in Cambridge, Md. 329 N. Main Street in Summerville, S.C.
2741 Papermill Road in Wyomissing, Pa.
1210 U.S. Highway 2 W. in Kalispell, Mont. 3413 10th Street in Great Bend, Kan.
5540 O Street in Lincoln, Neb. 1191 Cherokee St. in Marshall, Mo. 723 E. Parker Road in Jonesboro, Ark. 3333 Ambassador Caffery Parkway in Lafayette, La. 3210 N. Kinney Coulee Road in Onalaska, Wis.
2485 Notre Dame Boulevard in Chico, Calif.
1122 S. Carson Street in Carson City, Nev.
104499 S.E. 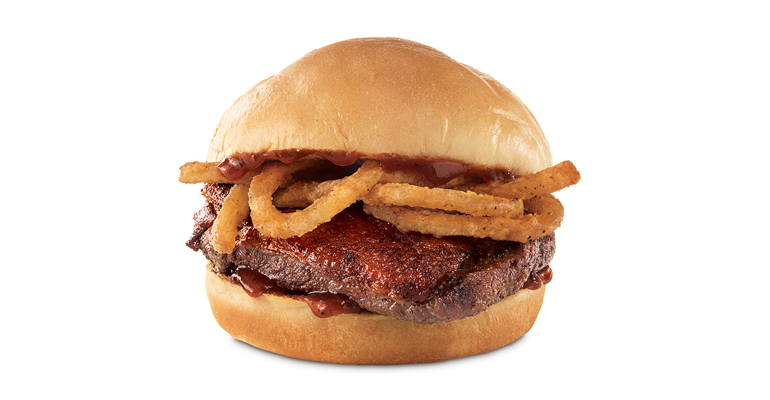 82nd Ave. in Happy Valley, Wash.
Arby’s first introduced game meat for a very limited time during deer hunting season in 2016, when it offered venison sandwiches made with farm-raised New Zealand red-tail deer that had been marinated in garlic, salt and pepper, cooked in sous-vide for three hours and served with fried onions and a Cabernet steak sauce infused with Juniper berries on a toasted bun. They were $5 and sold out in as little as 15 minutes. It was relaunched systemwide the following year for a single day while a separate elk sandwich was introduced at three locations in Colo., Mont., and Wyo. Arby’s is part of Atlanta-based Inspire Brands, which also owns Buffalo Wild Wings and Rusty Taco’s. Last month, the company, which is majority-owned by Roark Capital Group, announced plans to buy Sonic Drive-In.